It’s been over a year since I saw Venus Noire (Black Venus) at the New York Film Festival in the fall of 2010, and it never received a stateside release; actually I’m not sure it got much of a release outside of the international film festival circuit and a few European territories. So I’m betting most of you have never seen French/Tunisian filmmaker Abdel Kechiche’s problematic though worth-watching Saartjie “Sarah” Baartman, otherwise derogatorily known as the Hottentot Venus film, which starred newcomer Yahima Torres in the title role. The subject matter certain isn’t one that will attract audiences to the theater en masse; and the fact that the film is almost 3 hours long, with subtitles, likely didn’t exactly make potentially interested American distributors salivate at the film’s box office potential. But if you’re in Los Angeles during the month of February, and you’re at all interested in seeing the film, here’s your shot! It’s either now, or you wait for a stateside home video release (though it’s on DVD in parts of Europe and Canada; just not in the USA). But I’d recommend a theatrical viewing. It’s a challenging work, and one that I’m sure will piss a lot of people off, not only because of its content, but also the manner in which it’s handled by the director. It’s just something you should see for yourselves. Like those women on the magazine covers, Saartjie is mostly mute throughout the film, her body language representative of her thoughts, and clearly, she isn’t exactly cherishing the spectacle that’s being made of her physical self – much of it some will find difficult to watch, as it should be. Writer/director Abdellatif Kechichemakes sure of that, with numerous scenes running quite lengthy – possibly 10 minutes or more in some cases. Given the style in which the film is made, it felt almost like a documentary. Kechiche does little to distract from the narrative; the performances from the entire cast are realistic (you believe them), including Yahima Torres(as Baartman), Andre Jacobs, Olivier Gourmet, Elina Lowensohn, Francois Marthouret, Michel Gionti, andJean-Christophe Bouvet; there’s virtually no soundtrack (any music heard occurs naturally within the scene); the mostly hand-held camera moves but, oddly, you forget that it’s there – partly due to the stark nature of the physical settings, and also of the subject matter itself; you may feel guilty enough to look away, but you can’t. Although, I felt numb to it all, and I wonder if my reaction would mirror those of other people of African descent. By most accounts, I should have been appalled, disgusted, and completely turned off by Kechiche’s lengthy scenes showing all the horror that Saartjie endured before her early death. But, little of it actually disturbed me. In thinking about it further, I realized that it wasn’t necessarily because the filmmaker had failed in creating moments within the film that would elicit specific reactions out of me (although, who am I to say what the filmmaker intended); I felt numb because, again, as I eluded to above, we have and still are so bombarded with similar parades of images of women’s bodies (specifically black women’s bodies), accentuating specific attributes, whether still or moving, that what I saw on screen, as revolting as it was, seemed almost, dare I say, “ordinary” to me. From music videos, to magazines… however, less obvious and even deceptive are those studies, surveys, investigations into the so-called black experience that suggest an “otherness;” different, and thus must be observed and studied like monkeys in a cage. Whether it’s CNN’s redundant, surface “Black In America” series, the recent article about how black people use Twitter, or more direct, scientist claims that people of African descent are less intelligent than whites, and so on. I’ve rallied against most of these ideas and occurrences on this blog and elsewhere, and will continue to do so. However, the point here is that this long-standing, continuous assault on our senses, all suggesting an inferiority as the basis for marginalization of a group of people, have had an effect on how I react to similar instances (real or fictional). Numb – which can be a dangerous place to be, because it could lead to a lessened desire to act against like injustices. Saartjie doesn’t speak very much in the film, as I already stated; usually only when spoken to; we don’t really get a sense for how she feels. Certainly, as I said above, her body language leaves little doubt that this isn’t the kind of life she thought she would be leading, or that was promised to her by the man who brought her to Europe (he lied, telling her and her slave owner that she’d essentially be a song and dance act, not the circus freak show he would eventually convince her to be); but I would have liked to hear her wrestle with her predicament; here she is, seemingly a willing (coerced) participant in an act, sharing in the benefits afforded by the booty (no pun intended), though unequally, with her captors; but struggling to come to terms with the truth of who (or rather what) she is to the ignorant, yet curious and enchanted audience that pays to watch her perform. To contemporize it, think of the strippers who are “trapped” by the money they earn used to feed, house and clothe themselves, but who struggle with the impact the work they do has on their lives, and the perception others have of them. Not exactly the same thing as what Saatjie endured, but I’m trying to make sense of what I felt was one of the film’s notable deficiencies. We see Saartjie through the eyes of her captors and the audiences that pay to see her – as a lottery ticket, and a spectacle respectively – but we get few glimpses into the mind of the woman that the body belongs to. From the film, we know she despised her treatment, she’s outright defiant in moments, and the filmmaker does attempt to humanize her, giving her some 3-dimensionality; and I never once felt like he was being exploitative; but, as is, it’s still questionable just how much control she really had over her predicament (although we know that she was a slave). In the film, she remains something of a mystery, and I can’t say whether that was all intentional on the filmmaker’s part, as, I’d guess, he tried to piece together a personality based on limited availability of information, written by others about her. There’s also that saying about the the presence of mental shackles even in the absence of tangible ones. Director Kechiche’s film isn’t a lecture on the matters it documents. Each scene is presented “as is,” without any obvious commentary, you could say. It’s neither what I’d describe as a call to action. You are simply witness to an ugly injustice, an accomplice even, and your reaction to it is just that… your reaction, based on your own life experiences, which will also determine what you choose to do about whatever it is you felt, assuming you’re inspired to act in any way. Don’t go into this looking for a biopic of Baartman, as you will be disappointed. It’s more a document of a very specific part of her life, that which she’s most known for. And despite the title of the film, she instead feels like one of several equal players in this tragedy, instead of its star center. There’s also what I’d call a disconnect between the filmmaker and the material. Like I said, he doesn’t necessarily take sides. In fact, the film played out more like a series of filmed news reports. It does take a few creative liberties, however, the script remains fairly close to the true story of Saartjie Baartman. At almost 3 hours in length, some editing could have been done to trim it a bit, without losing its substance; and that running time makes it a tough sell for audiences outside of the expected art-house crowd – especially here in the USA. Although, I certainly hope it does receive a wide enough release. I’m curious about global reactions to the film. I suspect most aren’t at all familiar with Saartjie Baartman’s story, or are even aware of the derogatory “Hottentot Venus.” In a way, I actually envy those who’ll be seeing the film ignorant of the real-life story it’s based on. Most importantly, it means that one is less likely to spend time comparing the film’s details to what they know of the historic figure the characterization is inspired by. I can only imagine what their reactions would be, but I expect sharply contrasting sets of opinions. I’m left with conflicting thoughts on the film, and I wasn’t even sure how I would review the film. I feel like I could write volumes on the experience I had watching it. But maybe that’s all a good thing. I think a second viewing might be helpful in clarifying my thoughts. If anything, it’s not a film one walks out of the theater and immediately forgets. Other reviews I’ve read thus far have expressed concern about the film being hard to watch – not because it’s a bad film, but due to the contemptible scenarios Baartman lived through as explicitly documented in the film. As I’ve said before, the subject matter is already controversial enough, that any film made about Baartman will find it impossible to escape controversy. Kechiche’s handling of it is obviously crucial, and I’d say he handles it better than I expected. It certainly should inspire further discussion, especially with regards to contemporary correlations. Some folks have seen it at a special screening in New York. Of these, some had to walk out. This was not because it was a bad film, but because for the viewers, it was too much for them to take. One may have to be emotionally ready to watch it. And it echoes the kinds of exploitations and cruelties still visited on black women whether inAfrica or in Western countries like the United States. 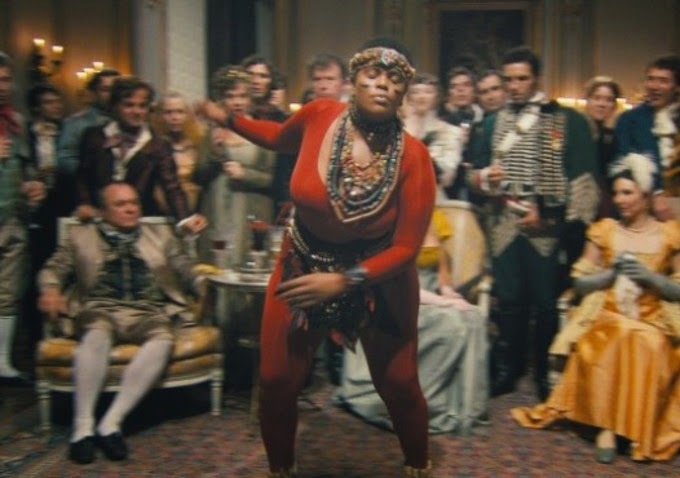 This film, Venus Noire, directed by Abdellatif Kechiche, is about the exploitation and degradation of an African Khoikhoi woman who became more in/famous after her deathwhen her body and genitalia were examined–in life and in death–by so-called scientists and then preserved and exhibited in a Paris museum until 1974. Saartjie (pronouncedsar-key is an affectionate (?) Afrikaans term meaning “little Sarah”) or Sarah Baartman was an enslaved orphan (from the many colonial wars between the Khoikhoi and the white settlers). Baartman was probably in her late teens when she was talked into coming to Europe by a brother of her master with the promise of quick riches and eventual return. Instead, she endured five years of being exhibited as a kind of circus animal in Britain and in France. When her notoriety wore off, the woman was paraded before scientists and racists who were convinced–because of her color, her unusual dimensions, and her genitalia–of her subhumanity. Lastly, she was forced into prostitution in the Parisian underworld to survive. She never returned to South Africa, dying in 1815 from the effects of pneumonia, smallpox or syphilis or all three at the age of 25 or 26. Baartman’s skeleton, pickled brain and private parts were only recently repatriated toSouth Africa after President Nelson Mandela formally requested that the French government return them in 1994. Can you believe that the French put up a fight for her remains for eight years? They were upset at the possibility that other nations–especially of those they had colonized–might ask for the return of their national treasures or artifacts that the French absconded with during the past. Saartjie Baartman was buried with honor near her birthplace in her Khoi people’s homeland in 2002.